Benissa is a charming holiday resort in the Alicante region with beautiful coves and beaches as well as a picturesque old town. As well as being popular with people looking for a beach holiday, it is also a favourite with hikers who enjoy exploring the rugged cliffs and mountainous region forming a backdrop to Benissa. Benissa has six pretty beaches which are perfect for sunbathing, swimming or snorkeling. 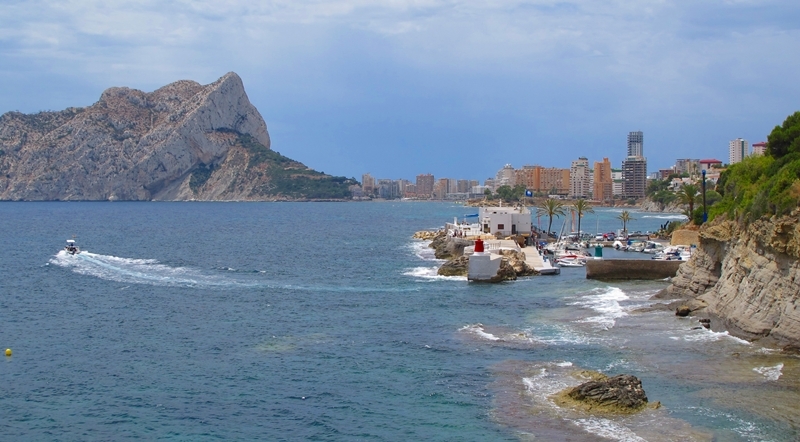 Les Bassetes Bay has great views of the Ifach rock in nearby Calpe. Els Pinets Cove is a safe place which is ideal for families with children. The jetty and promenade at L’Advocat beach is great for an evening stroll. La Fustera beach has fine natural sand, crystal-clear waters and is surrounded by sea-grass meadows. Nearby is La Fustera cove standing 10 metres high where you can enjoy a magnificent view of the Benissa coast as well as the Ifach rock. La Llobella cove is quiet and unspoilt which is perfect for swimming or snorkelling. El Baladrar cove is protected from the easterly winds with a 30-metre high cliff providing shelter. Its shallow waters and vast sea life make it perfect for swimming or snorkelling. Benissa has a rocky coastline with an eco-trail starting from the Benissa Playa Aula de la Mar tourist information office. Along the walk, you will see the varied flora and fauna as well as enjoy great views along the coast. This is a nice, gentle walk and a lovely way to get to know Benissa. This 4km stroll along the coast will take you past the beaches of La Fustera, la Casa dels 100 Vents and Les Bassetes nautical club. It's easy enough for families to do and you can always stop to catch your breath and enjoy the views. If you are looking for something a little more challenging, Benissa’s wild and rough landscape should be up to the mark. There are several routes along the Bernia, La Solana, Olta and Malla Verda mountains. You can go hiking, horse-riding, cycling or climbing. Don’t forget your camera as there are some stunning views and scenery to enjoy along the way. A gentler stroll is along Benissa’s old town with its narrow cobbled streets and medieval buildings. A good place to start is the town hall in Plaza del Portal, which started life as the hospital in 1790 but fell into disrepair. It was restored and reopened as the town hall in 1981. The old town hall is in Calle Mayor dating back to the 16th century. Nearby is the old church square, which is a picturesque spot often used for Benissa’s outdoor leisure and cultural events. The Purissima Xiqueta parish church dominates the town. Work began at the turn of the 20th century but it is a beautiful neo-Gothic structure with an amazing central dome and altar. After all this activity, it could be time to find a restaurant or bar for a chance to sit down and relax. Benissa has no shortage of fine places to dine out, particularly along the coast and in the old town centre. Typical local dishes include paella in many different varieties, other rice dishes, fresh fish and special hand-made sausages with local butchers still using traditional recipes handed down through the generations. Benissa is a cultural wonderland with natural beauty, fine local food, stunning historic buildings and fiery fiestas. Although Benissa's church looks Gothic, it was actually built in the 20th century. It's a great place for enjoying the Mediterranean and the mountains. If you're missing British products, there is an Iceland supermarket in Avenida de Europa.